The sage-grouse is believed to have been extirpated from the Yakama Reservation since the 1960's. The reasons for their extirpation off the Yakama Reservation was likely habitat degradation largely due to historic sheep and cattle grazing. Habitat assessments were done in east Satus in 2001 to assess the suitability for sage grouse. Approximately 1/3 of the assessed acreage was considered suitable for winter and brood habitat. There is currently restoration work being done in East Satus to increase suitable acreage. In 2006, our program began releasing wild Greater Sage-grouse onto the Yakama Resveration first releasing 37 grouse from Hart Mountain Oregon. Since then over 190 sage-grouse have been released. Capture areas have included Wyoming, Oregon, and Nevada. Translocated sage-grouse have been marked with radiotelemetry collars and backpacks in order to monitor the effectiveness of the reintroductions efforts. In 2014, a breeding display ground was established and is being monitored to assess the state of the sage-grouse breeding population. As many as 15 males have been identified displaying on what is being refered to as the "Radio" lek. Lek being a term used for the site upon which the grouse congregate and go through their courtship behavior each year. For more information on the Yakama Nation sage-grouse reintroduction effort call David Blodgett III @ 509-865-5121 ext 6332. In 2011 and 2012 roughly 55 Rio Grande and Merriams wild turkeys were released at the Satus Wildlife and Recreation Area. Many of the birds were monitored using radiotelemetry collars. The resulting data indicated a high level of successfully surviving birds. The turkey population has since expanded in both numbers and distribution now occupying much of the riparian habitat along the Yakima River from Union Gap to Mabton. Due to the great success of this project we are now holding a spring turkey season in which lucky hunters are able to draw a special tag to hunt one bearded wild turkey at the SWRA. For more details call or text David Blodgett III @ 509-949-7437. Although the spotted owl is the only terrestrial ESA-listed species currentlyknown to breed in the Reservation's forested area, Canada lynx, grizzly bears, and gray wolves are native to the area and may reestablish populations, and bald eagles are beginning to nest once again in the valley. The Spotted Owl Project is responsible for completing Section 7 Consultations with the U.S. Fish and Wildlife Service on forestry operations that may impact these species or their habitats. 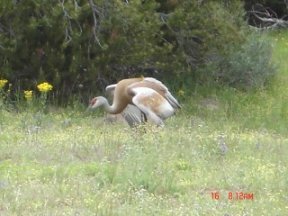 The greater sandhill crane (Grus canadensis tabida) has been making a very slow recovery since its near extermination by hunting and habitat loss in the late 19th and early 20th centuries. It is closely associated with wet meadows and has been designated an endangered species by the Washington Department of Fish and Wildlife (WDFW). The species was extirpated from Washington State in 1941, with the last known record being on the Yakama Reservation. A breeding population reestablished in the 1970s in the Conboy Lake National Wildlife Refuge on Reservation (in the Tract D area, outside of the Yakamas� Closed Area). Pairs have now also been documented at a few sites within the Closed Area. Although sandhill crane breeding areas were once fairly widespread on both sides of the Cascades, currently the Conboy Lake NWR and Yakama Reservation Closed Area sites are the only known places in the state where these cranes breed. Aerial surveys have been conducted of known sandhill crane nesting sites in this region through the coordinated efforts of USFWS, WDFW and the Yakama Nation, with effort varying from year to year with funding levels. 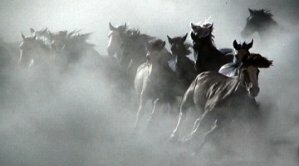 Tribal Wildlife Grant funding in 2004 and 2005 allowed complete surveys to occur in the Yakama Reservation Closed area, leading to discovery of 2 new potential breeding areas. 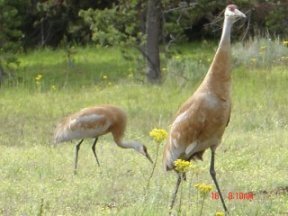 Seasonal protections of nesting pairs from disturbance have been incorporated into the Forest Management Plan, and future efforts will focus on continued monitoring of known sites, and protection and restoration of sandhill crane habitat as one component of an integrated meadow restoration program. Picture 2 - Sandhill crane male giving a display. Butterflies serve as excellent indicators of meadow health, as their close relationship with a specific place and specific host plant results in their populations responding quickly to changes in the meadow environment. They also serve important ecological functions, as pollinators, primary consumers of plants, and food source for many animals. The mardon skipper (Polites mardon) is a small butterfly found only in two disjunct areas of open, fescue-dominated grassland habitat in Washington, and one location each in Oregon and California. In Washington, a large portion of known mardon populations occur on the Yakama Reservation. Populations at at least five historical sites in Washington have been extirpated in recent years, and the butterfly has been listed as endangered by the WDFW (and as a federal species of concern by the USFWS). 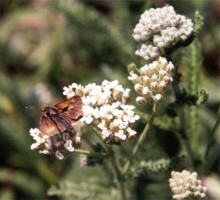 General threats to the mardon skipper and its habitat include forest encroachment, invasion by native and non-native plants, development, grazing, agricultural practices, and application of pesticides. Intensive surveys have been conducted on the Yakama Reservation beginning in 2004, under the USFWS Tribal Wildlife Grant funding. Several new breeding sites were discovered by these efforts, and protections from habitat destruction were built into the 2005 Forest Management Plan. Mardon habitats and populations will be one focus of future efforts to assess forest meadow health and initiate restoration projects. Mardons serve as indicators of the health of certain types of drier meadow habitats, and we plan to select other butterfly species to monitor as indicators of other meadow types. For more information on this project please contact Gina King at (509) 865-5121, x6330, or Katrina Strathmann at x6377. Mardon skipper on a Yarrow flower. 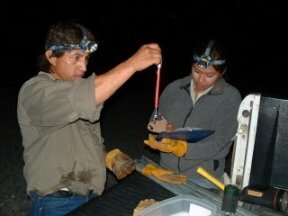 The Yakama Nation Wildlife Program conducted the first known bat surveys on the Reservation in 2004 and 2005. The project is funded by a USFWS Tribal Wildlife Grant (TWG). The project has three main objectives. The first is to simply determine what species are present on the Yakama Reservation. There is a great diversity of habitats available here for many species of bats ranging from the arid shrub-steppe in the east to the pine and mixed conifer forests in the west. 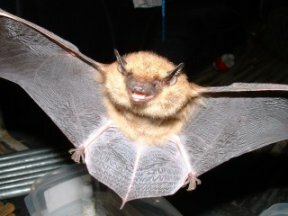 A habitat analysis suggested there should be twelve species of bats present on the Reservation and after two summers of surveys, we have been able to confirm the presence of eleven of these. The second goal is to determine if any Townsend�s big-eared bat maternity colonies are on the Reservation. Townsend�s big-eared bats are a Washington State Candidate species and a Federal species of concern. These bats are a very sensitive species in part because the females roost in the same large maternity colony every summer and are highly sensitive to any disturbance. Townsend�s colonies are often in human-made structures and if disturbed enough will abandon the site. We want to locate any of these sites on the Reservation to be better able to protect them from human disturbance. The third objective is to incorporate management guidelines for bats into a Comprehensive Wildlife Management Plan. The Plan will be the culmination of our work funded with TWG. For more information on this project please contact Mark Nuetzmann at (509) 865-5121, x6333. Picture 2 - Gabe Swan and Victoria Walsey weighing a bat. Forest carnivores are critical ecosystem components and include several keystone species. Carnivores native to the Reservation include imperiled (and likely extirpated) species such as the grizzly, lynx, and fisher as well as the extremely rare wolverine and wolf. Other carnivores such as mountain lions, bobcats, coyotes, black bears, otters, martens, and weasels are more common on the Reservation, Prior to 2004, the Yakama Nation Wildlife Program had been conducting sporadic, low intensity carnivore surveys in the Reservation�s Closed Area. In 2004, 2005, and 2007 we received Tribal Wildlife Grants from the USFWS to conduct extensive inventory surveys across the Reservation. We have utilized several surveys methods including remote camera stations, track plates, hair snares, and snow tracking surveys. The first known photograph of a wolverine in the southern Washington Cascades was taken by a remote camera on the Reservation in 2006. Work is ongoing to determine if a resident population of wolverine are present in the region. We have received funding to continue forest carnivore inventory work in 2008 with generous grants from Wilburforce Foundation and the Norcross Wildlife Foundation. Long-term goals of this project are to quantify and map carnivore habitats on the Reservation and to incorporate management guidelines into a Comprehensive Wildlife Management Plan to restore the native complement of carnivore species. For more information on this project please contact Gina King at (509) 865-5121, x6330, or Mark Nuetzmann, x6333.